IRISHMAN Tony Mangan has travelled farther in his life than most gallivanters and globe trotters. 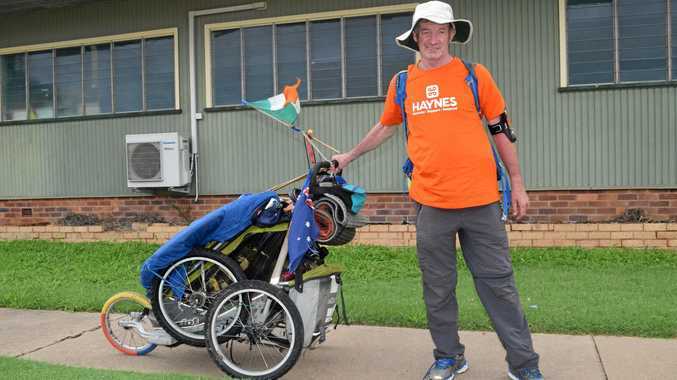 At 60 years of age not only has Mr Mangan cycled, and run, around the world, but now he's undertaking his next mission - to walk around the world. And it's a mission with a purpose, to raise awareness of cancer, and spread his message that "Life is precious. Early cancer screening saves lives." 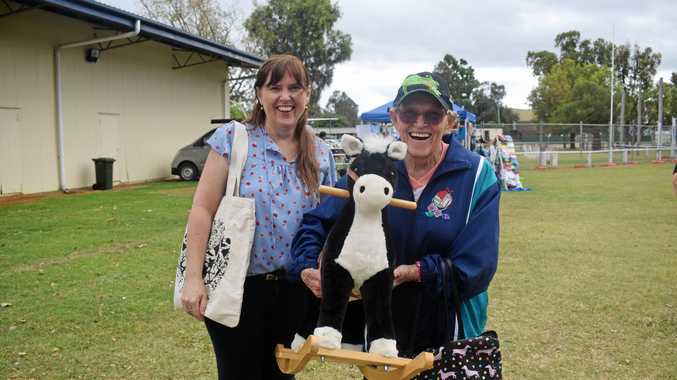 Last week Mr Mangan passed through our region, and the Chinchilla News was lucky to have his stop by the office to tell of his incredible adventures. Mr Mangan said his first taste of slow travel came with his decision to cycle around the world. "I developed a love for travel, in particular slow type of travel cause you have great people connections, see people at the side of the road, cycle past little cafes and they wave," he said. "Or pass their house (and they) ask me if I want a drink of water or tea, coffee, or even an overnight, that happened so much on my world cycle, I loved it." Slowly Mr Mangan drifted from cycling into running, competing in marathons before finding they just weren't long enough. "The longer the distance, the more competitive I became," he said. Eventually he moved into extreme running and from there, decided on the "ultimate endurance challenge", to run around the world. After 21 years of dreaming, it became a reality when he set out from Dublin in 2010. By the end of his run, he'd travelled 50,000kms. It was during Mr Mangan's run that he experienced the realities of cancer, when, during his challenge, his mother was diagnosed with bowel cancer. "It came out of the blue because we didn't have any cancer history in our family," he said. "My mother, who was the strongest woman I ever met in my life, wouldn't let me compromise my dream. "In short my dream had become her dream and she told me she'd be heartbroken if I stopped, if I shortened it (the run)... and I was not even two years into a four year world run, and her prognosis was two years." When Mr Mangan finally reached the end of his journey, in Dublin once more, his mother was well enough to cross the finish line with him. After that experience, Mr Mangan said he was left asking "what now?". "People like me will probably be lowered into our graves still looking at Google maps," he said. And so, he decided to take the next step, and walk around the world. And two years in, he's "having an absolute ball". "It's been an amazing experience so far, I don't want it to end," Mr Mangan said. "The most incredible hospitality all around the world. "My cancer awareness message is.... life is precious, every cancer screening saves lives."